Well, the signings are over for another twelve months and so this is the time when Marcia tries to reconnect with the characters in the book she is writing. They disappear when the real world intrudes – which is probably very sensible of them. The poor things have enough problems of their own without adding to them with the dramas we watch unfolding on our television screens or read about in our newspapers. 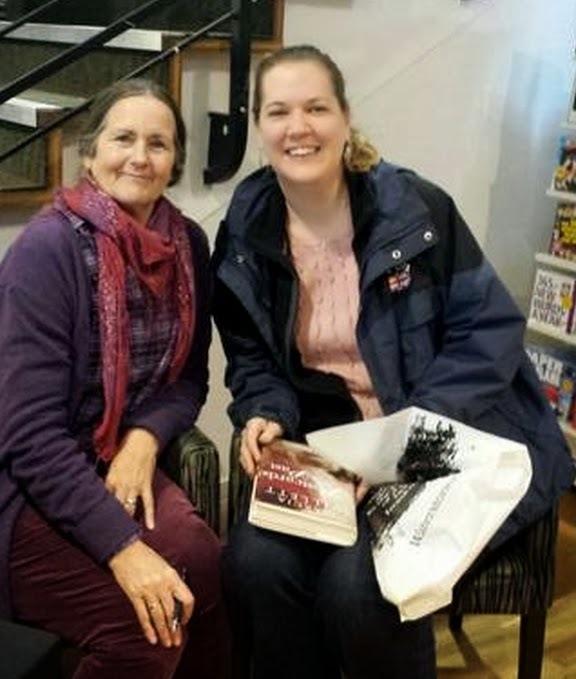 with one of her loyal readers, Claire Rudkin. This year, however, it is not quite as simple as that. Next Wednesday evening (at 7.30 if it matters) Marcia will be giving a talk in Brendon Books of Taunton. The bookshop organises The Taunton Literary Festival: click here if you want to learn more. Anyway, that will mean another interruption in this business of connecting with characters but that is all part and parcel of a novelist’s life. It does mean, of course, that we have done almost nothing since the last signing as Marcia reads herself back into the book. So, this week I will say something about what I have been up to – or more accurately what I have not been up to. In London there is a news agency that sells video clips to news outlets around the world. These are shot by all sorts of freelance people of which I am one. You may have heard that a very severe storm was to cross the UK last week. These are unusual: most storms start way out in the Atlantic if not close to North America, wind themselves up over the ocean and hit us long after they have begun to calm down. This one, however, was predicted to start quite close to the UK and we were all prepared for winds in excess of 100 miles per hour and lots of rain. Newsflare contacted me and asked me to provide bvideo of this storm. looked pretty gloomy when I went down there. This would not have been a problem but for one small thing: in this area it never really happened. There were two reasons, as far as I can make out. The first was that the storm started even closer to the UK than was forecast and not built up to be much of a problem until it was well to the east of South Devon (actually it was not until it hit Denmark that the wind speeds peaked). The second was that the effect down here seemed to be very local: worse on the north coast than the south. Anyway, the upshot was that there was nothing worth filming so I didn’t. What was really irritating was that there was a tree down on the railway line a few miles away and well within my patch. This happened in the early hours of the morning and a train (passenger but empty) did run into it but there was no damage and I didn’t hear about this until everything had been cleared up so there was nothing for me to see. It’s a bit like that when you want pictures of birds and so on. There they are, sitting comfortably, until you have the camera in hand and switched on. Some sixth sense tells them that their privacy is about to be invaded and they are away before you have time to hit the shutter. Plants are so much easier. Ready to be picked: the crab apples. Which leads me on to say that the crab apples have been picked by a good friend who will be turning them into crab apple jelly and, I have no doubt, letting us have a couple of jars in due course. This week we have four Labrador dogs instead of one. Why not? The top two photographs come from a reader in Canada. Here is the story. 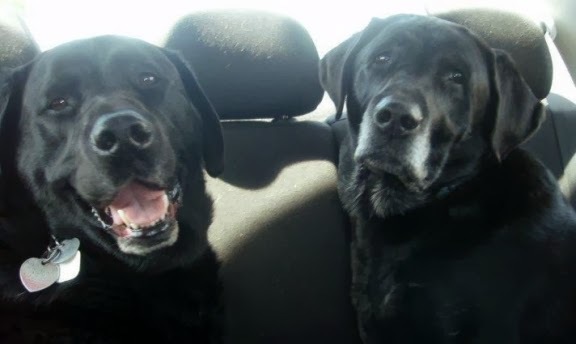 "The attached of Kyle (l) and Walker (r) is for your Dog(s) of the Week blog dog. Sadly, both have gone now and Wylie is now on scene. Wylie's name comes from a combination of what else.....Kyle and Walker. He is now 9 1/2 months old and is recovering from surgery from elbow dysplasia. (not sure of the spelling on that). He is doing well but the prescribed 6 weeks of "bed rest" is nigh impossible. We (he lives and is officially owned by my daughter and her husband) are trying though. By the way, Walker was a working guide dog for Canadian Guide Dogs for the Blind. He guided in BC for almost 10 years. Since we had puppy walked him he came back to us to enjoy his retirement. Kyle was also a Canadian Guide Dog and we puppy walked him too. Alas, he showed signs of knee dysplasia and he too was operated on. He was a wonderful pet for 10 years but was never accepted into the guide dog programme due to his occasional lameness. And the 3rd pic (I hope 3 photos is not too many) is of our friend's miniature poodle named Spike." Where is that picture of Spike? In the folder for next week. Meanwhile, the bottom photograph is of a dog that belongs to an old friend of ours (old as in years of friendship, you understand, not as in age) called Teazel and it is taken in one of the fields near here with Ugborough Beacon on the southern slopes of Dartmoor in the distance.